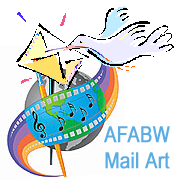 November 2, 2010 – Hollywood: This coming January, Artists For A Better World International will be launching a new “Mail Art” campaign. The campaign will center around celebrating artists and will also support Art Day, an international holiday for the arts. Art Day falls on the 2nd Friday of each August. Art Day 2011 will be on August 12. “Mail art” includes all types of unique creations represented on hand-decorated postcards, cards and/or envelopes. Stay tuned for details in January!